The Vertical Cuttings Dryer (also called Verti-G Cutting Dryer) is a vertical type centrifuge that is undoubtedly one of the most effective waste management equipment for oil- or synthetic- based drilling operations. The vertical cuttings dryer can effectively clean the drilled cuttings, recover the maximal drilling fluids and reduce the volumes of drilling wastes that has to be transported from well site for disposal. TDU should only be used when extremely necessary as they release many harmful chemicals to the land. After the treatment of TDU, the OOC can be controlled within 1 % and the remaining ashes can be utilized to make bricks used in construction. 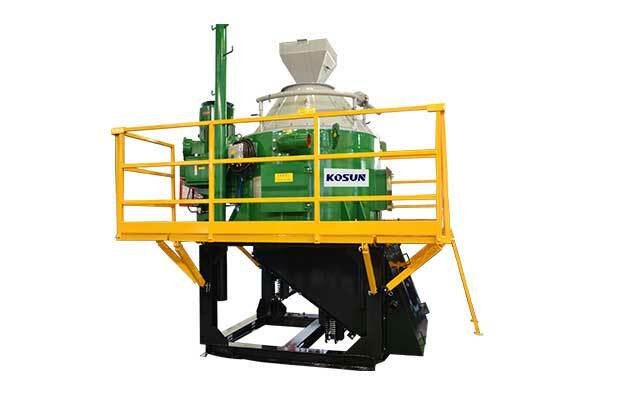 Kosun Thermal desorption unit (TDU) – It utilizes thermal energy to treat the oily contents. Normally, the materials treated by TDU, the solids control should be no less than 40%. Otherwise, it cannot be spilled well in the furnace. All oil type solids whose vaporization point is below 420 degree centigrade could be treated with this system. The oil type solids above mentioned is oil waste and a certain amount solids, like mixture of mud and sand. The pyrolysis furnace roller in this design heat the material and the material is pushed forward by shoveling plates welled with a certain angle on the roller’s inner wall. If the material were only oily mud, the spilling character would be lower. TDU’s cannot replace Vertical Cuttings Dryer.